The U.S. Navy is looking at ways to make their surface combatants less expensive to operate, and in the case of those stationed in Rota, Spain, more capable of defending themselves. One solution will be the installation of hybrid electric drive systems across the newest portion of the Navy’s destroyer fleet and the SeaRam point defense systems for destroyers stationed in Spain. Starting next year, the Navy will retrofit 34 of its newest Arleigh Burke Class destroyers with an electric motor tied to the ship’s main reduction gear, which will be able to propel the ship at speeds below about 13 knots. At higher speeds, where the ship’s LM-2500 gas turbines are more efficient, the ships will run on traditional power. The Navy plans on initially outfitting a pair of Destroyers with the system in 2016 and four ships a year after that. Now over to Rota, Spain, where the Navy has decided that the four Arleigh Burke Class Destroyers stationed there need the ability to defend themselves against cruise missile and aircraft attacks while also scanning the heavens for incoming ballistic missiles. Yes, it is a little bewildering to think that the Navy is just starting to come to terms with this issue, and the fact that most of the Navy’s ballistic missile defense capable surface combatants can’t look for air breathing and ballistic missile threats at the same time is a well known problem. So is the fact that newer Flight IIA Arleigh Burke Class Destroyers lacked of a any type of close in weapon system (CIWS) following their introduction into service. This issue has been partially remediated by the Navy with the retrofit of one Phalanx CIWS atop the aft structure of these ships. Still, this does not provide 360 degree close-in defense against incoming threats. 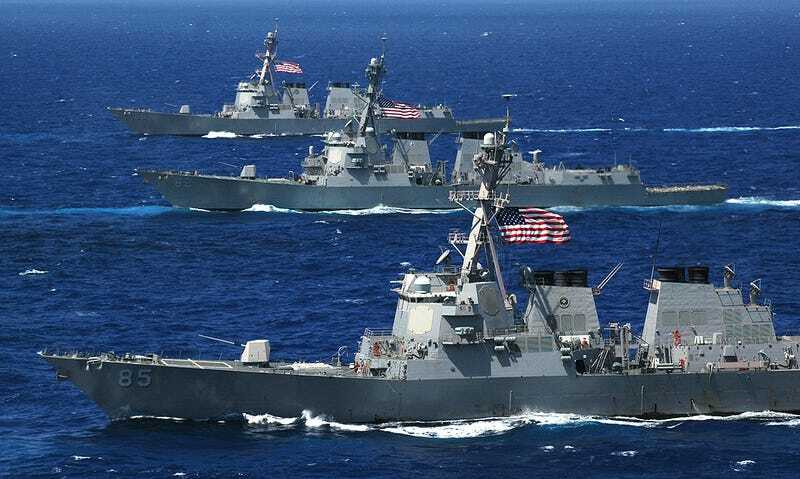 Although the newest versions of the Arleigh Burke Class’s ballistic missile defense capable AEGIS battle management system can search and engage both threat types at the same time, the expensive upgrade is long-off, if it comes at all, for many U.S. Navy surface combatants. As such, America’s ballisitic missile defense capable destroyers that are forward deployed to Spain, all of which lack this new upgrade, will be getting bolt-on SeaRAM systems. SeaRAM mates the Mark 15 Phalanx Block 1B radar and infrared sensor system with an 11 cell RIM-116 Rolling Airframe Missile launcher. The result is a self contained and highly lethal point defense system designed to knock down incoming missiles, aircraft and even some surface threats. Basically, SeaRAM will give these forward deployed ships a poor-man’s air defense system that can be used for close-in aerial surveillance as well as engaging targets while the ship is in ballistic missile defense mode and largely blind to these threats. In this configuration, basically these destroyers will have the same air defense capability as an Independence Class Littoral Combat Ship while they are in ballistic missile defense mode. An 11 shot magazine, which can only be pointed in one direction at any given time, may be a decent defense against non-state actors with cruise missile capability, or limited engagements with third-rate powers, but when it comes to a high-threat area, or say if Russia is the concern, forget about it. The Navy’s destroyer force forward deployed to Spain often operates alone in places like the Black Sea. If Russia wanted to destroy one of these ships they would volley dozens of cruise missiles of varying performance capabilities, engagement sensors and flight envelopes at the ship and once. This would quickly overwhelm such a modest system. Defending against such an attack would involve using a wide-array of the ship’s anti-air arsenal to “thin the herd” as it approaches. This is not possible when the ship is in ballistic missile defense mode, with its long range active sensors blind to such an assault. Having only a single SeaRAM with very limited sensor range and 11 rounds at its disposal in addition to a single Phalanx close-in weapon system may help defend against the first arrivals at best. For Destroyer Squadron 60 in Spain, which is made up of earlier Arleigh Burke Class destroyers with two Mark 15 Phalanx systems installed, it is not clear which (front or back) will be removed so that SeaRAM can take its place. The only other logical alternatives would be to upgrade these older destroyers to “Baseline 9” capability, where they could interweave air defense and ballistic missile defense capability modes at the same time, a hugely expensive affair, or deploy ships in pairs, with each one covering one mode at a time. This would greatly hamper how many places the Navy’s forward deployed destroyer fleet of just four ships can be at any given time. Keep in mind that much of the time one or two of the ships is not readily available for missions or only at a low readiness state. Tying up the two available ships for one mission would be a huge loss in flexibility, so the Navy has decided to go the cheaper route and adapt SeaRAM to meet its most basic needs. Like so many recent defense solutions, it is not nearly perfect, but it is better than nothing.